I've been corresponding with a gentleman in Israel who has taken great care to translate Reed's poem "Judging Distances" into Hebrew. An audacious undertaking! Having only a tenuous grasp of English myself, and no familiarity with the Semitic languages, I'm attempting to reverse-engineer the HTML generated from a Word document. Right-to-left reading is the least of my problems, and the commas are driving me crazy. Perhaps I may never get the knack. I'm ashamed to admit it, but while my mother lay in hospital, I went to the local library. It sounds bad when you say it out loud. Someone asks, "Hey, what are you doing here?" and you have to reply, "Well, my mom's in the hospital, y'know, so I had time to photocopy some citations." I was looking for a biography of Joe Randolph Ackerley, a former editor of the BBC's magazine The Listener, author and memoirist. I knew from a collection of his letters that Ackerley and Reed were friends, so I felt sure that A Life of J.R. Ackerley (Parker, 1989) would probably turn up something. Boy, did I ever hit paydirt (practically an anthill)! The Mary Jane and James L. Bowman Library is a branch of the Handley Regional Library system. It's a relatively new building, built on donated lakefront out in the boonies of Frederick County, Virginia. I'd never been, but from previous research I knew they had a copy of the biography. Since my mother was sleeping about 20 hours a day in the hospital, I pocketed all the loose change for the copiers that I could carry, and dropped by during a long lunch. It was well over 90° outside, and the library sat baking in its own parking lot, with nary a tree to shade a weary traveler (or a weary traveler's car, which currently is without a working air conditioner). In construction, the building reminded me strongly of an industrial chicken coop. Perhaps that was what the architects were going for. Wander through the suburbs, with quiet thoughts of brothels. And sometimes thoughts of churches. Which is exactly the sort of playful, irreverent humor that makes Henry Reed terrific. Ackerley probably thought the "churches" line was great fun. Listener editor A.P. Ryan, however, arguing that this was not the sort of poetic language they were seeking to publish, wanted Reed to change "brothels" to "movies" (pp. 185-86). As far as I know, the poem never did appear in the pages of The Listener, but Reed seems to have befriended Ackerley because of the row. Later, Reed pops up again at Ackerley's farewell send-off from the magazine (which he refers to as his "funeral party"). Ackerley wrote in a letter: '...it was jollier than expected and went on until 8:30. The ebbing tide of distinguished guests had left behind them only a Corke and a Reed, and those I took off to dine. It was my last expenses sheet' (p. 352). The Corke can only be the poet Hilary Corke. It was October 29, 1959. “Did I ever know a virtuous literary editor? Did I ever know one with an unfaltering conscience, a literary editor, a single literary editor, not given to compromise or betrayal? One. Joe Ackerley, of The Listener, whom some of his older colleagues in the BBC did their best now and again, to get rid of, in part, I imagine, because they knew him to be homosexual” (p. 182). Ackerley was certainly open about his sexuality in his memoirs, and his fiction also handles homosexual themes. I sometimes wonder about our friend Henry, and how overt or obvious he may have been, what troubles it may have caused him, and whom he trusted. I know of several stories in which people, strangers and acquaintances, didn't know he was gay. A fact which seemed to simply amaze him, as if it were the most obvious thing in the world. I like to read with a rubber band and a pencil. The rubber band is chiefly used as a bookmark, keeping me from having to re-read paragraphs or pages to figure out where I left off when I set it down. Starting a new novel, everything to the rear of my placeis rubber-banded, the bulk of the book, but once the center pages are crossed, the rubber band jumps to the front. But the rubber band also serves to keep a pencil secured inside the book, at least with paperbacks. I'll write notes in a paperback, but hardcovers are either to expensive to mar in that way, or just too cumbersome. In a paperback I'll underline and write notes in the margins, but I also write brief character outlines in the blank pages between the title page and first chapter, or on the inside-back cover. This is mainly because I have a lot of trouble with names — especially if they're foreign. French and Russian novels are the worst. The rubber band also helps me find my front- or end-notes in a hurry, when I forget who someone is (or what they did). There's a scene in Grosse Pointe Blank, where John Cusack runs into one of his former English teachers outside his old high school and asks if she's "still inflicting all that horrible Ethan Frome damage?" "Terrible book," he says, or somesuch. That was as much about Ethan Frome as I knew. Not a ringing endorsement, but not exactly the Times Literary Supplement, either. I had an epiphany this morning, pre-shower and still laying abed: Ethan Frome isn't so much a love story or morality tale, as it is a good horror story. Ethan Frome is Psycho, Blair Witch, and Deliverence. Ethan Frome is Fatal Attraction, in turn-of-the-century New England. I'm trying to put detailed, relevant descriptions with each entry in the bibliography, making searches easier, and references to my hardcopy less necessary. At the bookstore, hogging wireless bandwidth and surping at a giant latte, I spotted a mention, in the Introduction to the Collected Poems, of Reed staying at the Antelope Hotel while he was researching his biography of Thomas Hardy (which he never finished), in 1945 or '46, after his release from the Service. Turns out, there are several Antelope Hotels in the UK. At first, I thought it was this Antelope Hotel, in Sherbourne, Dorset. Dorset is Hardy country. But the Introduction specifically mentions Dorchester, and both Hardy's cottage and his estate, Max Gate, are closer to that city. Perhaps this Antelope Hotel in Poole was the hotel mentioned? Last night, after dinner, I was trying to track down a photograph of the hotel, and discovered there once was, in fact, an Antelope Hotel in Dorchester proper. It's been turned into a shopping arcade. A mall, of all things: The Antelope Walk. A crying shame. In 1685, James Scott, the Duke of Monmouth and illegitimate son of Charles II, made a play to overthrow King James II. Following the defeat of the Duke's forces at the Battle of Sedgemoor, participants in the Monmouth Rebellion were rounded up and tried for treason. The "Bloody Assizes" (trials) were presided over by the Chief Justice of the King's Bench, better known as "Hanging Judge" Jeffreys, for his ruthlessness in currying favor from the Crown. The old Oak Room is still there. It's a tearoom, now. One of my favorite, obscure facts about Henry Reed is that he once worked with (or was supposed to work with) Ken Russell, the director. Ken Russell, of Tommy fame. Ken Russell, director of Altered States. Billion Dollar Brain (with Michael Caine as Harry Palmer), and Bram Stoker's Lair of the White Worm. The Ken Russell. In his early days, Russell made short films and documentaries for British television. He made several experimental films with the BBC's Omnibus series — films which many consider to be of questionable taste, but which foreshadow some of the truly great movies mentioned above. This is where Reed comes into the picture. 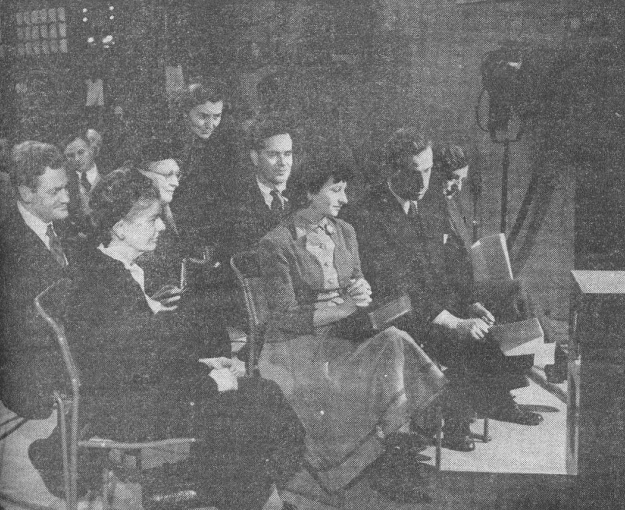 The award-winning playwright took at least one course with the BBC on writing for television (Reed is in the front row, second from the right) in 1952. By the late 1960s and early 1970s, the days of radio drama and comedy were drawing to a close. The Third Programme, for which Reed wrote so many memorable plays, became Radio 3 in 1970. Reed, however, still receives script and scenario credits on the film (for that matter, so does Richard Strauss). The draft of Reed's untitled teleplay remains in a notebook, collected among his personal papers. It would be his only venture into the realm of television.